One of the secrets of the trade show display industry is that manufacturers, distributors and suppliers use multiple outlets to create what you are buying. It is extremely rare to find one location that will produce everything you need under one roof. Rather, what really exists is a community of companies that source multiple items from other companies but sell it to you as if they produced it themselves. A mid level 10ft hybrid display consisting of a fabric main graphic plus some direct print accent graphics on the sides. A low cost retractable banner stand using vinyl inkjet printing. An economy dye sublimation printed 6ft table throw cover that has full color graphics on all sides. A premium kiosk/counter with dye sublimation printed fabric graphics that you will use at the front of your display. When you view a web site that sells trade show displays you think you are getting everything from that company. But, most sites that “sell” displays don’t actually make those displays. They just resell the material direct from a wholesale manufacturer. The site you purchase from probably will present items as packages or as paired items that compliment each other (such as “you might also like” listings). But, none of these things will ship from the same location, be produced on the same printing press, nor even use similar hardware. Rather, the 10ft display will perhaps come from a supplier that sources the hardware and fabric portion of the printing from china while the direct print elements are done in the US. The banner stand may be produced at a shop at the company you purchased from on an inkjet press that is never color calibrated. The throw cover will be produced in the US but, again, from a different source. And the kiosk will be done with custom hardware and printing that may or may not be performed inside the shop that supplies the unit as that particular manufacturer chooses to not disclose how they produce graphics. So if that is what you are dealing with, how do you ensure your company colors will print correctly and match from item to item? In some cases, you just can’t! Especially if you are in a rush. Large format printing (Dye Sublimation, Inkjet, Lambda, Etc..) is not as consistent as standard offset printing. When you hire a local offset printer to print some brochures and business cards for you there will be guarantees on color. If your company Pantone is 200C, you can be sure that the printer will use that exact ink to print your job. But in large format printing you are working on a CMYK printer that must be calibrated to each particular job. Pantone 200C on one press may look different on another press in the large format world. Even with print standards and calibration, every single location is going to produce the color differently every time. And, since each item of our display list above will also be printed on different materials, you now must deal with how a color can look on one fabric to another, or on vinyl. It can really become a challenge. 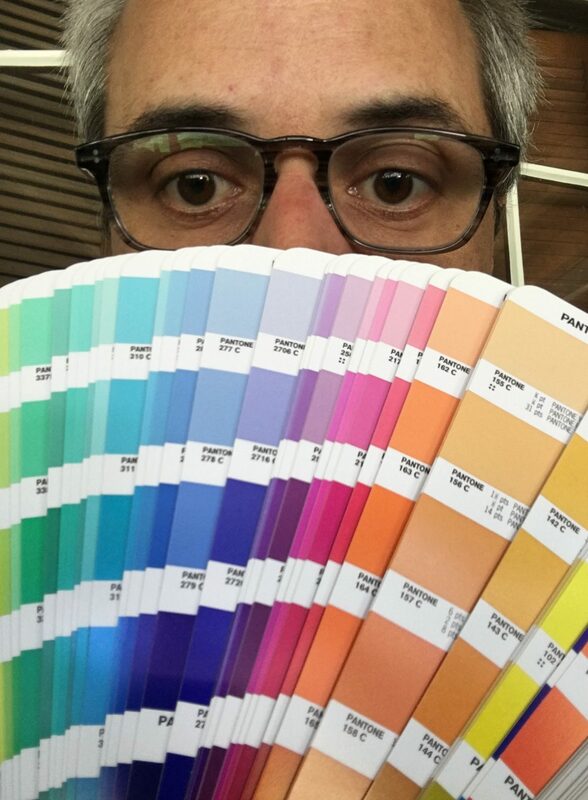 I’ve seen the same Pantone printed seven different ways for one client on one job, even though the color match was specifically requested on each job. It just becomes a subjective question for the press operator as they have a variance they work with that is considered acceptable. So, how do you ensure your color is consistent on all items? First, you must plan ahead. To properly create a display with consistency and continuity takes a lot of time. You should never rush the production of your purchase. Instead, you should be planning months in advance to get this done correctly. The reason for this is that, unless you find that one manufacturer that can do everything under one roof (which will be impossible) you will need to plan to send some items that are done first to the next supplier so a color match can be performed. Second, always ask for printed proofs. These proofs should be done on the material and press related to the product being purchased. And, you should request two copies of each so you can keep one for yourself. The other copy is something you can use to send to other locations, through your point of purchase, to match color at press time. Third, use Pantones. It still isn’t a guarantee of color output but using a Pantone Solid Coated or Uncoated color in your layout will at least give a press operator a reference of where you want to be. Be willing to accept the CMYK Process version of your Pantones as well. 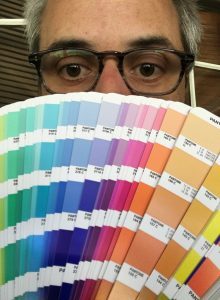 If Pantones are not in your corporate lexicon, and you only use CMYK references for color, you will need to have printed swatches already produced that you can provide to press locations. Items such as existing brochures, business cards, previously produced exhibit materials, and so on, that have the color you accept will be useful to get a future match. The company you purchase from should be explaining this to you at the time of purchase. If they don’t, you are not working with a company that is reputable or experienced. It may seem like a lot of extra work on your part but it is absolutely necessary if color is critical to you. It is going to cost a little extra money and time to get a match on all items due to the expense of shipping proofs back and forth from printer to printer. However, even after all of the effort, there is still no guarantee on an exact match due to the different press locations. So be prepared. Colors will appear slightly different on different fabrics. Your display will probably have a few different fabrics used to create the various elements. Depending on the stretch, thickness, grain and so on, a fabric will show color in a few different forms. Vinyls will not display a color in the same way as fabric generally. For a quick example, look at a glossy paper business card with your logo on it versus a general non-glossy card stock with the same color. The difference you see is a basic example of how fabric and vinyl can differ. The direct print items on your order will be on a hard material like Sintra or Polystyrene. Again, color will display differently compared to the other materials used on your display. Pantone colors on large format are normally printed to their Process CMYK equivalent. Though some large format printers will attempt a perfect match to the coated or uncoated version you shouldn’t expect it. Therefore, decide at the beginning of your job to shoot for the Process version. Be willing to accept some minor differences on the final outcome from unit to unit. If that isn’t an option, be sure you communicate this up front when you are placing your order so it can be determined if enough time exists and additional costs are calculated. You may need to consider slight design changes on some of your display items to make sure they compliment each other visually. In the end, your budget and your need date will dictate what is possible and acceptable. Questions or comments? Why not contact Jacob Norris? When Is An Xpressions® Display Not An Xpressions®?